It’s not the kind of news we usually receive from our Source athletes. 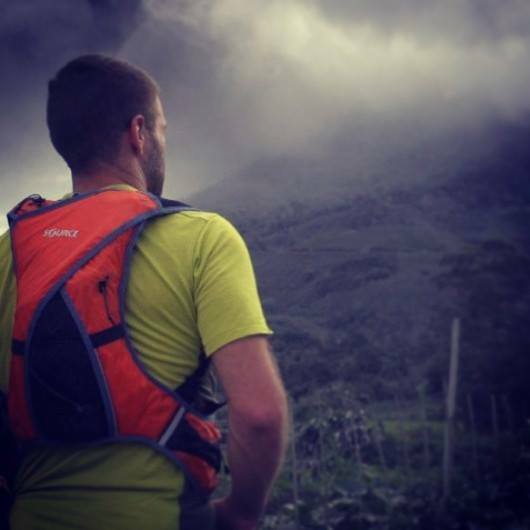 But Richard Bowles does call himself an Adventure Runner – and he means business. If you’re following Richard Bowles or us on our Source Facebook page, you got the pictures as the story unfolded last week: Richard is in Sumatra, shooting new promotional video and photos (also for Source). Shortly after Richard and his crew arrived, the Indonesian government raised the highest alert level on Mount Sinabung (which had been dormant for centuries before an eruption in 2012 which killed 2 people) and forced the evacuation of 30,000 residents. Bowles and filmmaker Stamatakakos had entered the area of Karo, Sumatra, earlier in the week. Driving into the ghost towns that had been abandoned, Bowles admitted they were aware of the imminent danger of Mt Sinnabung which had erupted a record two times a day for the past 2 weeks, with reports of spurting clouds of hot gas and ash spurting up to ten kilometres up into the sky. What the two Australians had not anticipated was the choking hot gas clouds and ash that fell constantly, or the golf ball size rocks that pelted down at them, causing them to seek shelter in a nearby abandoned home. In the tiny farmhouse where they sought refuge, they met two local residents who had refused to leave, fearing their homes would be ransacked by looters, but were now desperate to leave as they feared they would die there. Public transport in the region had been cancelled, and the only way out was to find a private car, which they finally managed. Bowles says, ‘It’s so sad to see the fragility of these peoples lives, the farmers crops are destroyed under tons of ash, many homes have been destroyed, and for many that spells financial ruin and they have nothing to return to. It will take years for the people of this region to recover”. Stamatakakos, who has now left Indonesia, said, “It was unbelievable seeing the power of Mt Sinabung, and we felt each eruption shudder through the ground around us, it was literally the most terrifying experience of my life, and I’m grateful to have made it out alive”. Bowles, now staying in the North Sumatran town of Medan will remain in the region for the next week to assist with aid efforts for those displaced by this violent force of nature. Follow Richard Bowles on Facebook – and get first hand pictures. We’ll also keep you posted on our Source Facebook page.